What It Does L-Arginine Do? Several studies have shown that the amino acid l-arginine can help in the treatment of angina, by easing symptoms, increasing exercise tolerance, and improve blood vessel function. There is also strong evidence that the supplement can help with erectile dysfunction, by creating nitric oxide which is important for proper blood flow. Studies have also shown that it may be helpful in treating people with congestive heart failure by improving cardiac performance. 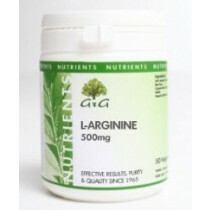 There is a lot of speculation about what else l-arginine can do for your body and your health. However, the truth is that there needs to be more research and studies to prove what many already know, and more studies need to be done before we know exactly what this amino acid can do for you. The supplement likely acts as an enhancer for athletes, but even this has not been proven through clinical trials, only by the results recorded from athletes who have used the supplement. There are a few studies that show that the supplement may decrease inflammation of the bladder. It will also relieve leg cramping and weakness due to blocked arteries, as it helps improve blood flow. It may also improve kidney function in those who have had transplants. There is not yet enough evidence to use the supplement for other disorders and illnesses, although there are several that are speculated. For example, it may assist in the treatment of migraines, high blood pressure, and dementia. It may also be effective in improving male fertility, and even in treating the common cold. However, these uses cannot yet be proven as effective treatments. There are several potential side effects of the supplement, although short term use is deemed fairly safe. Those taking l-arginine may experience headaches, bloating, nausea, indigestion, diarrhea, allergies, and low blood pressure, just to name a few. However, most people do not experience any side effects.